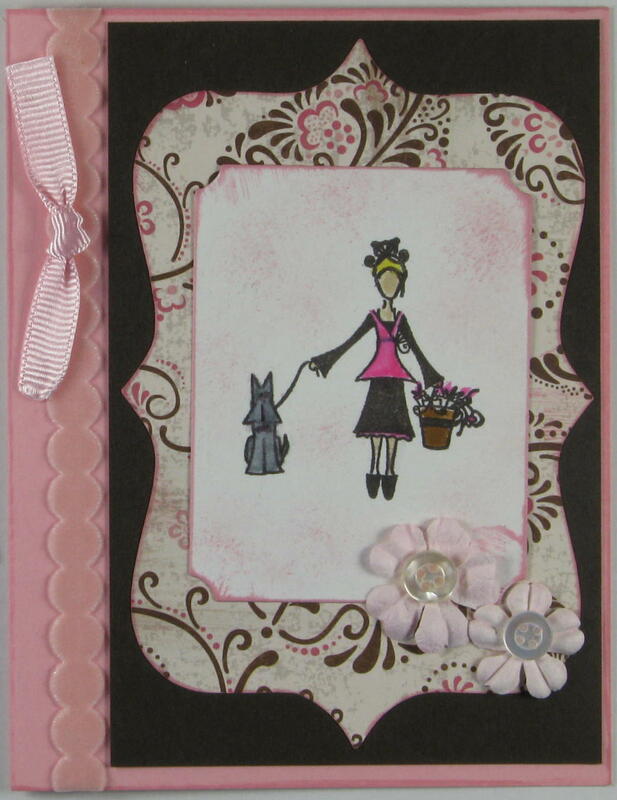 Here's a little card I did for Fia's challenge at Sketches 4 All. 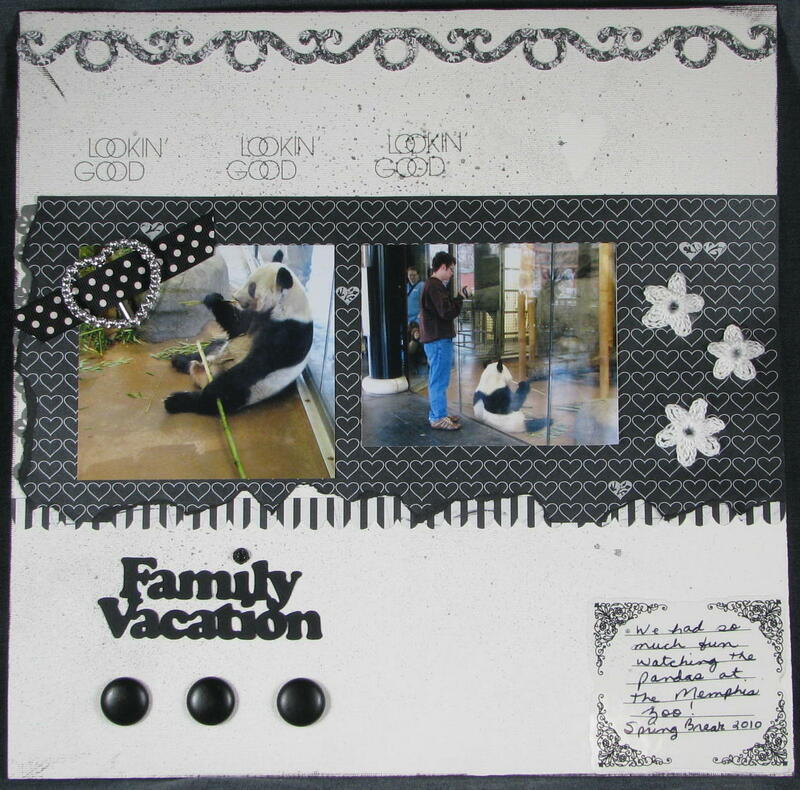 I was inspired by Amanda Jones over at The Studio to make this collage. 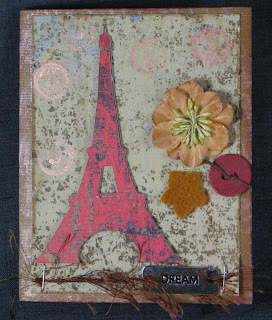 I used 7 Gypsies Orchestra paper and rubbed some Tim Holtz Distress Ink in Antique Linen over it. I made my own flower and used a crochet flower made by my friend Mary--with a little of the distres ink rubbed on it to make it look a little older. 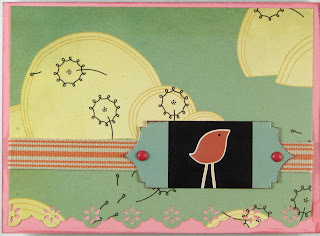 The birds are from a lovely Cosmo Cricket paper pack--looks very vintage I thought. 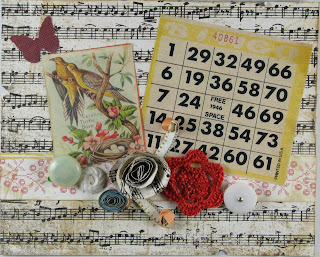 The buttons ARE vintage, and I thought they all had something unique to offer to this collage! I don't know if this will go in a frame or what yet, but I thought it turned out ok. I thought it would be good for Brenda's challenge for fall colors over at Sketches 4 All! 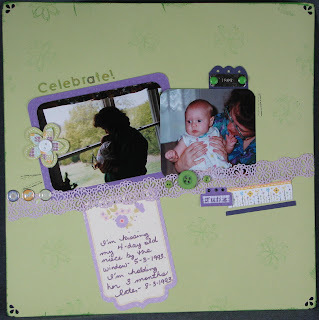 I made this layout for a challenge to take two ugly, mismatched pieces of paper (sorry Glitz) and make a layout with it at The Studio with Sketchy Thursdays 8/26 challenge sketch. 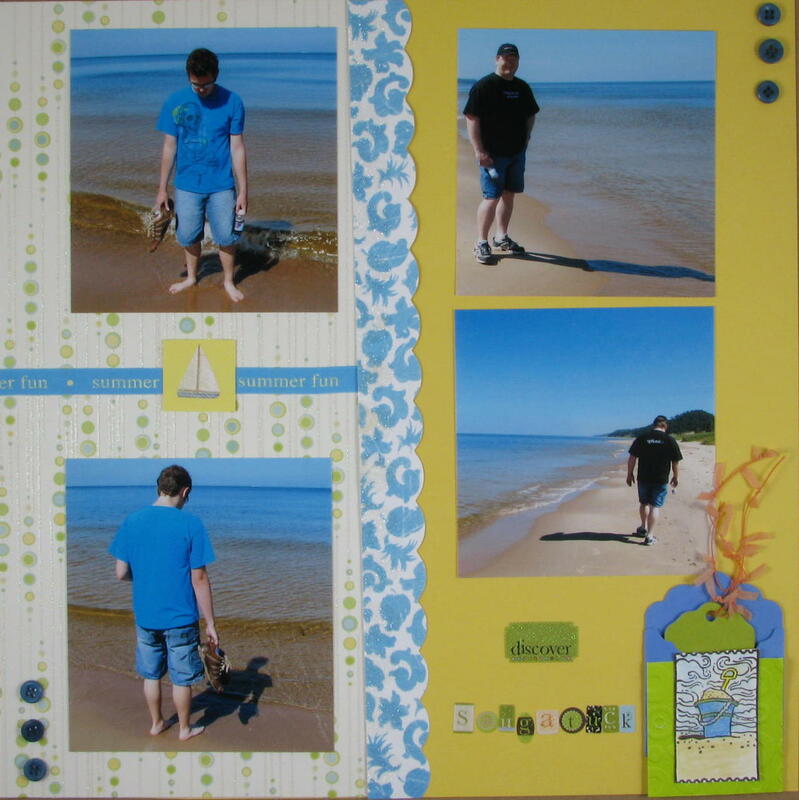 I made it pretty simple to fit into a new (to me) challenge site called "Lasting Memories" Layout Challenges. 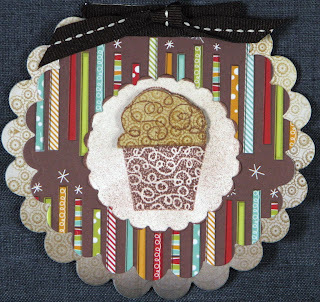 To me this is simple because it only uses paper and stamps around the edges--no embellies like ribbons, jewels, brads, etc. For this challenge, I was to use the scraps from Workout 26 or 27 on Scrapfit! The only thing I didn't use on my layout was the brad in the middle of the flower. I used the ribbon's back for the layout! 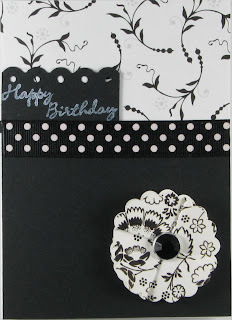 In the card, I used the front (polka dot) which I really think is cute! I made this for The Studio Challenge to make a Layout about something you only do in the summer! 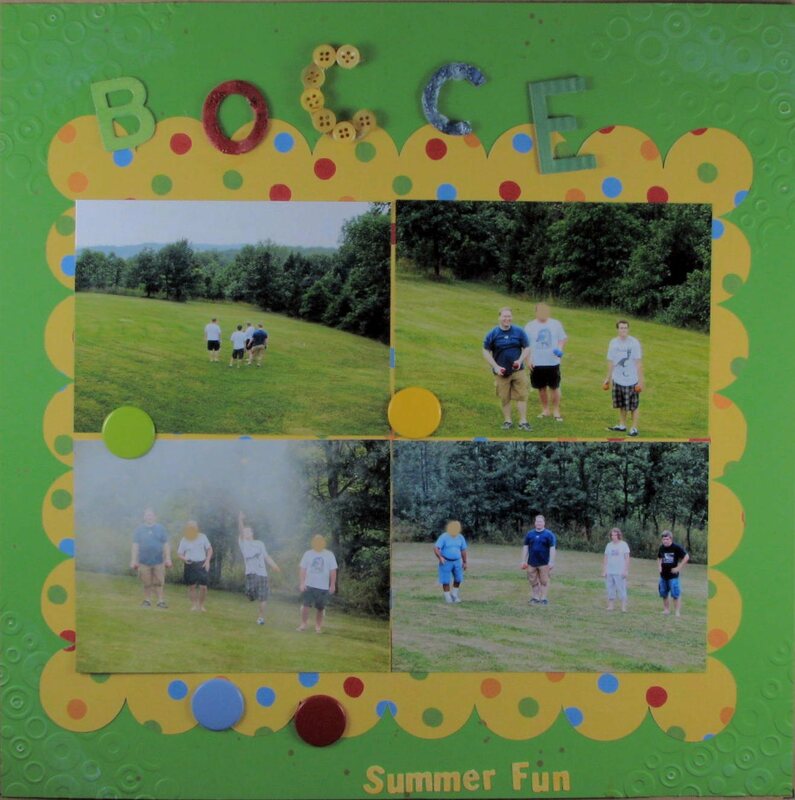 We only play Bocce at the 4th of July celebration at my twin sister's house! I've blocked out some of the faces of those people from whom I didn't receive permission to share on the Internet! It's a fairly simple layout, but I focused on Circles quite a bit. 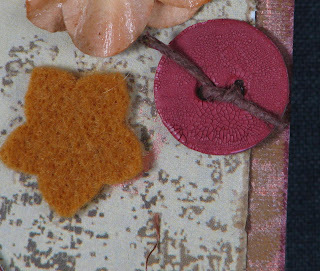 I have embossed the corners of my cardstock and placed big, colored brads randomly over the page as if they had been thrown by the players. There's a little sprinkling of mist on the page. Each of the letters is a different color and has a different texture. 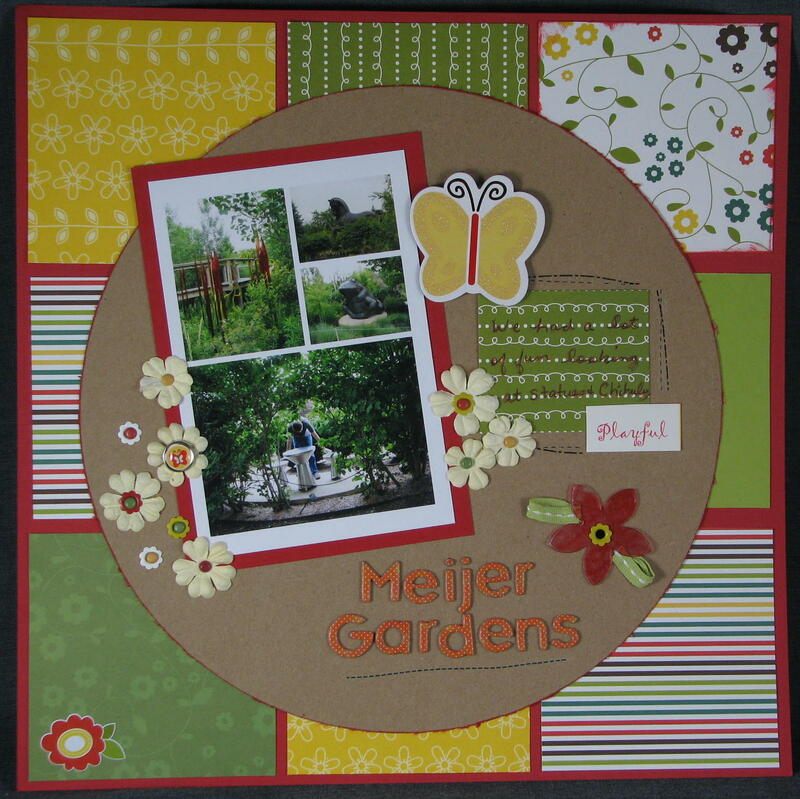 I made this layout from a sketch by Sassy Lil’ Sketches. Every single one of the rectangles are textured with the exception of the darker yellow which is from a Prima tablet I received from a friend. I had all of these tiny photos of some of Chihuly's sculptures as well as some orchids from the gardens when we visited this June. I thought the sketch was perfect for these photos! If you follow my blog at all, you are probably wondering: "Just how many photos did this girl take at the gardens?" Well, too many I suppose! I'm still not finished scrapbooking them! Just call me Mrs. Simple! 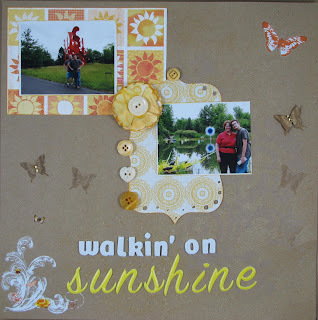 I made this card for the Let's Ink it Up challenge to use yellow (and of course a stamp). It's a dotty thank you card! I used Lydia's idea to use my embossing folder with a rolling pin (what else am I going to use it for) when the paper is bigger than the folder and/or your embossing machine. Why didn't I think of that? She's so clever. 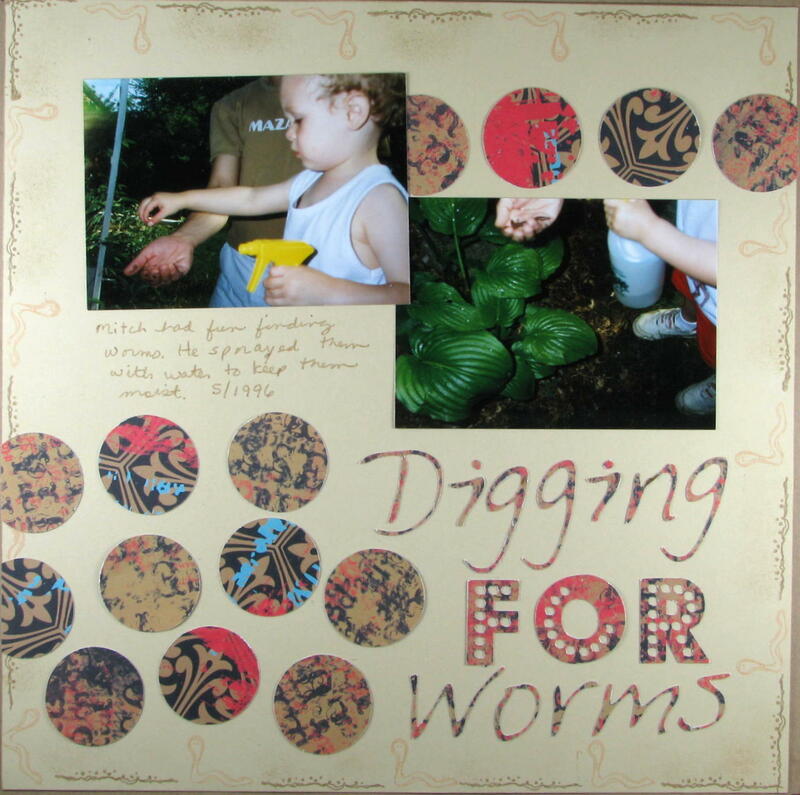 If you go over to visit her (do, her work is AMAZING), tell her Kelly Massman sent you--just for fun! 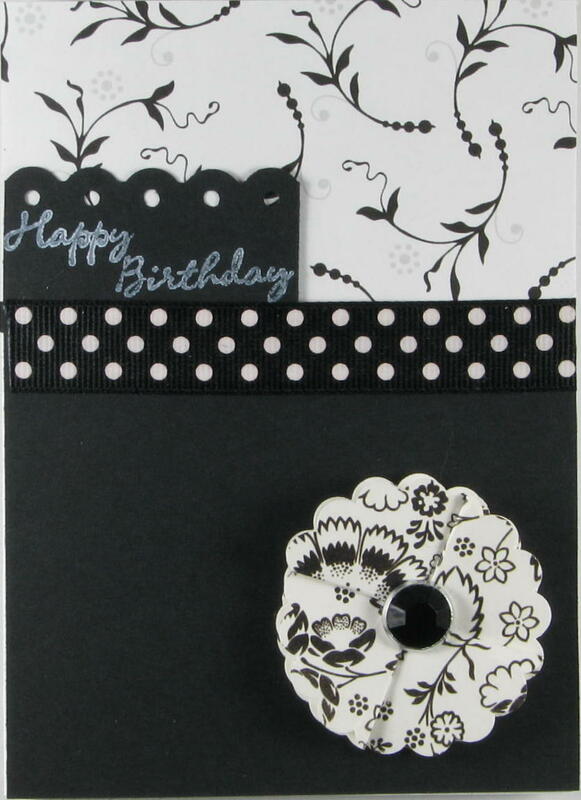 Here's a quick little card I made that will fit easily in the mail! I made it for The Studio's Challenge to use Cosmo Cricket in a card. I made this using a sketch from Stuck. I've decided to stop hoarding my eyelets and brads! Ha ha. 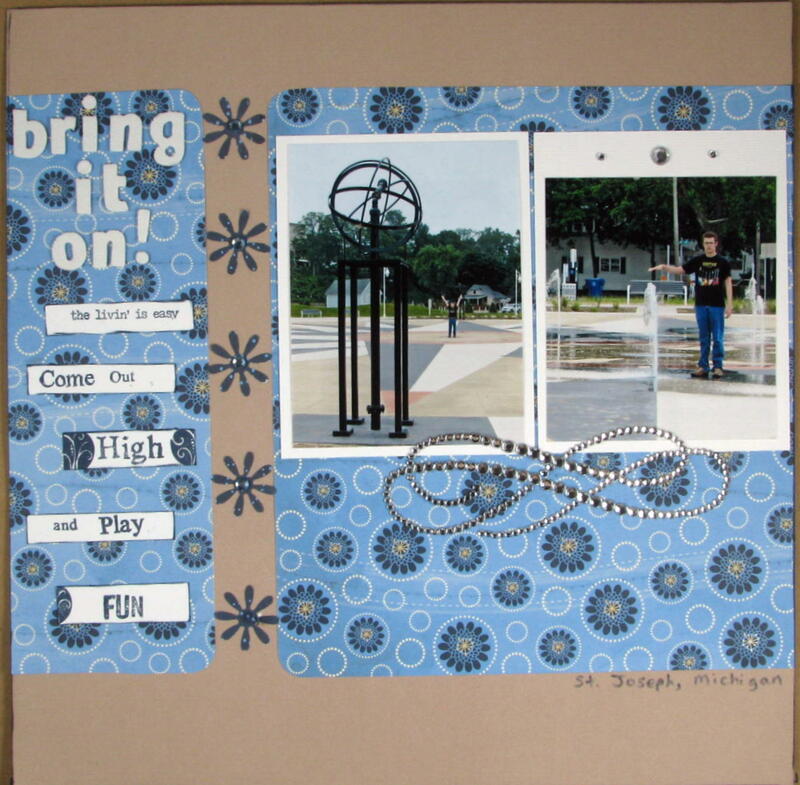 I made this for Scrapfit's Workout 26. I used a sketch from Pagemaps through Sketches 4 You. 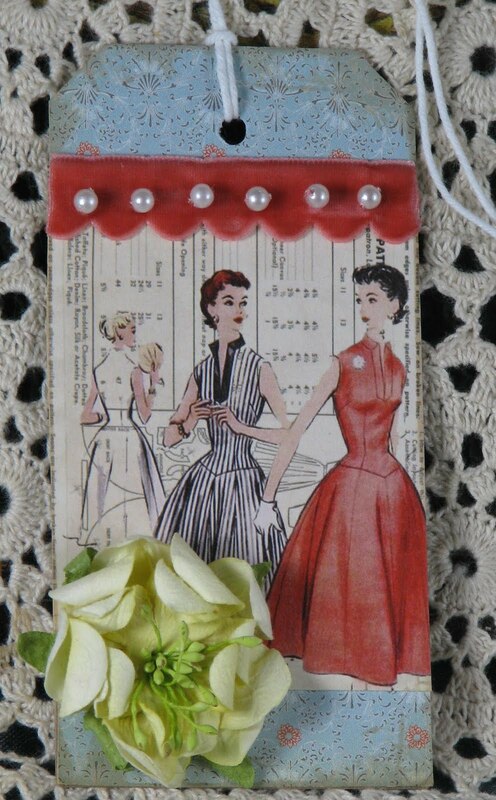 I used my trusty I-Rock for the jewels on the ribbon. Rock Candy Stickles were added to AC foam Thickers. I created this for this week's TRIFECTA at Design Dollies! I can't believe I did it again!! I used Rock Candy Stickles on the Sun and the waves! The background paper is TEAL and I accented with Royal Blue. My teal is a little darker than what some of the DT used, but... it's still teal...I'm still working on the light box for my LOs! 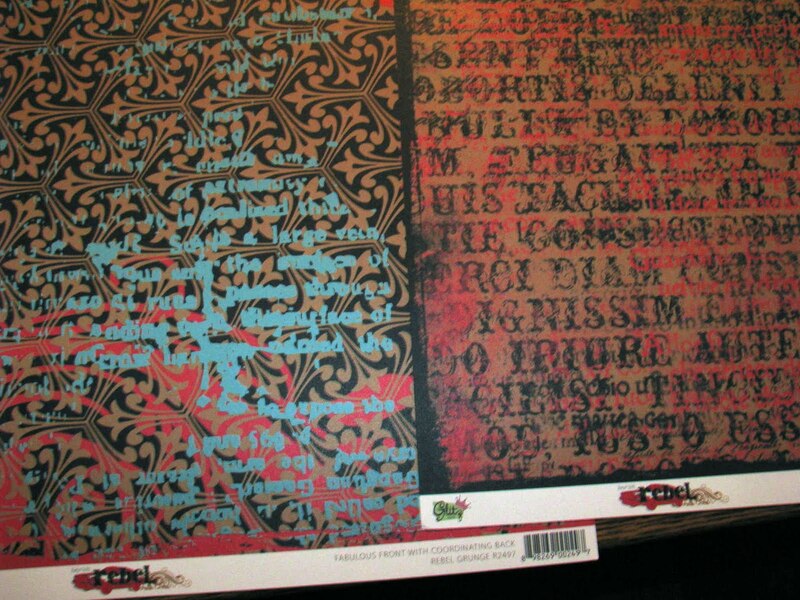 It seems there is a shadow at the top of the page, making it look darker than what it really is! I made this little Christmas card for The Paper Variety's Christmas card challenge! The background is Little Yellow Bicycle! The sentiment and snowflake are from SRM Stickers. 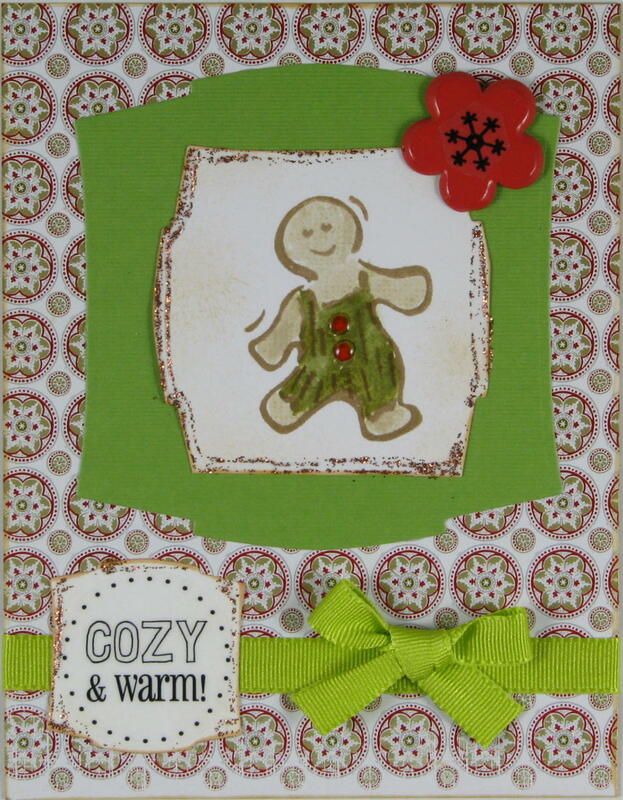 I put a little copper Stickles to resemble festive sugar around the white Spellbinder shapes! 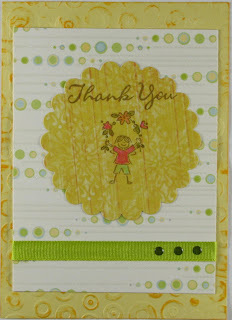 I did this for Scrap and Stamp's challenge sketch. Note: the stamps are from CTMH! 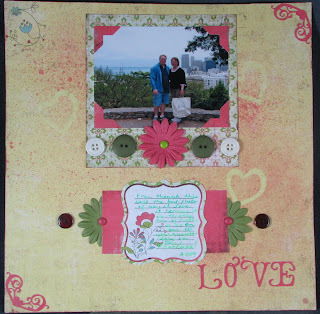 Here's a little scraplift I did for Kim's challenge! 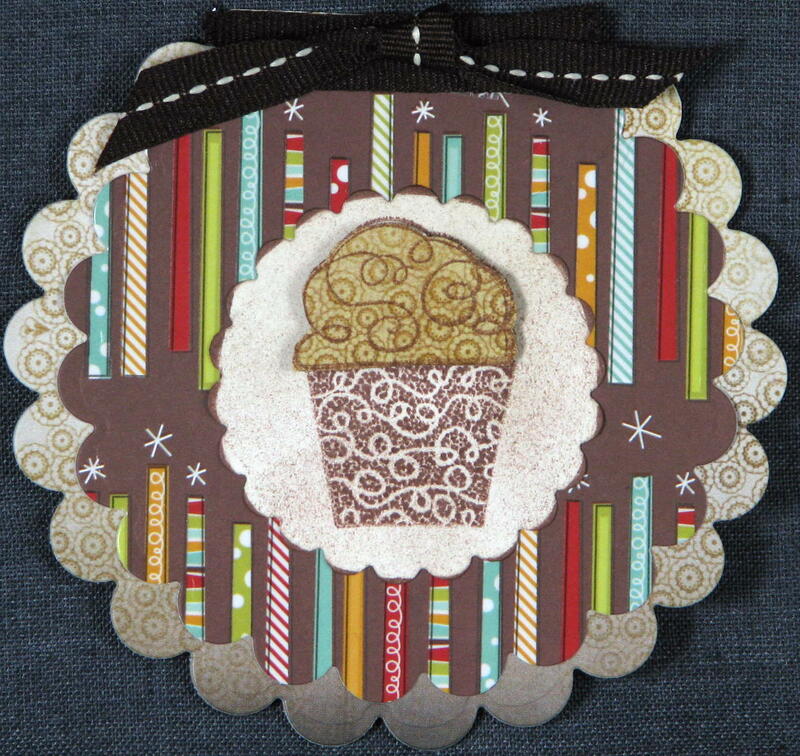 Here is another cupcake card I did for one of Fia's challenges on Sketches for All. 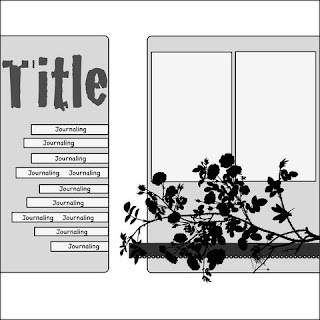 I made this layout for Sketches in Thyme weekly challenge! The title and year glittery letter stickers. I have a jewel in the center of each firework sticker! The balloon was so cool! We kept watching it float higher and farther away until we actually started getting worries. Then, finally, it blew up in the air!! Very amazing firework!!!! 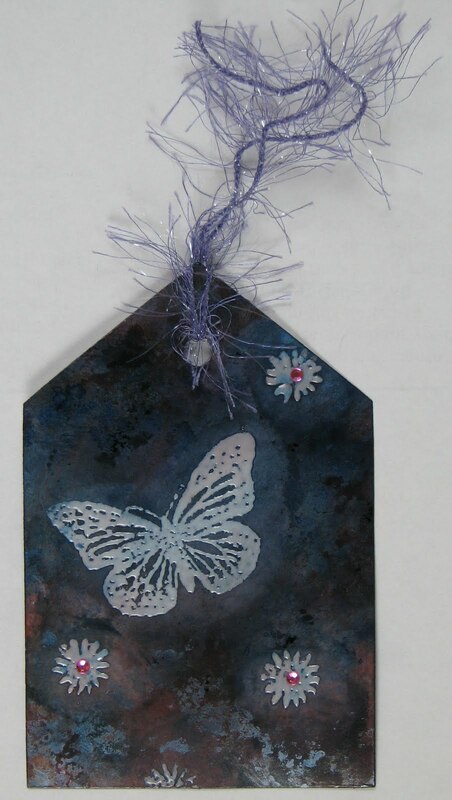 Here is an embossed resist tag I did for Denise's Let's Ink challenge on Sketches for All. Here's a quick LO that I did using Stacy HW's sketch for this week that I entered in 2 challenges over at Sketches for All. Stacy has weekly challenges and does some card challenges, too! She gives AWESOME RAKs--check it out!! 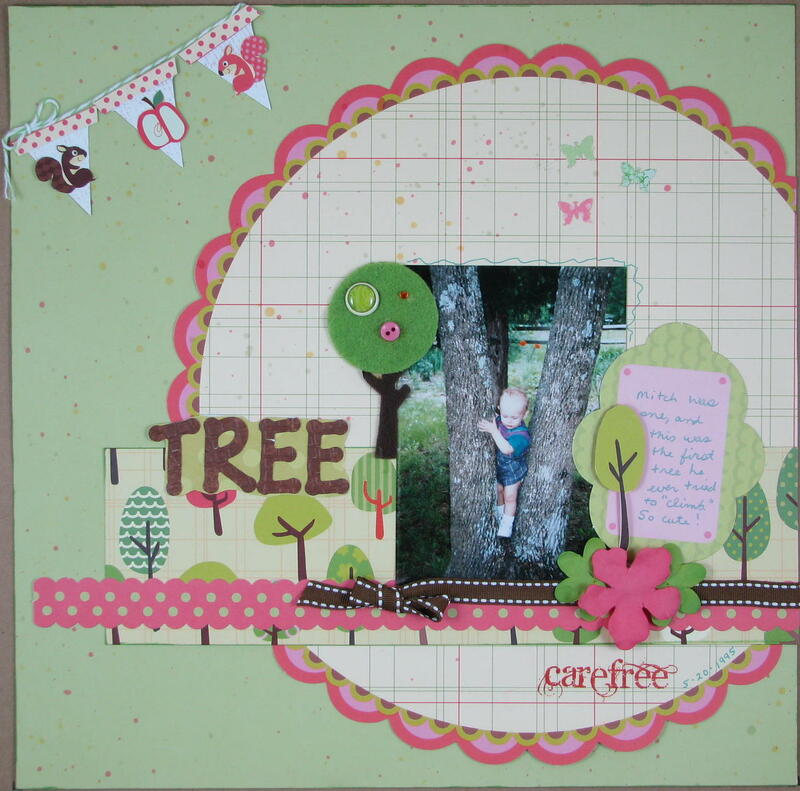 My Little Shoebox: Imagine a Tree: Diecuts, Happy Trees, Furry Friends, Fresh Air and Get the Camera! 2. My Little Shoebox, Imagine a Tree bright colorful patterned paper! 4. 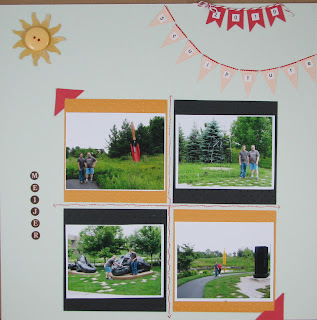 1 photo, 1 button (on felt tree); 1 brad (on tree); 1 rubon (carefree); 1 embossed item (title)! 5. yellow, green, pink hand-made shimmery mist--like confetti falling! 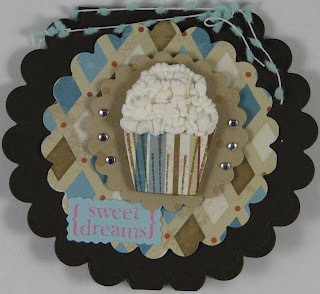 Cupcake Inspiration Challenge #71...! and Sketches 4 You. The cute cupcake is from Fiskars (my secret sister sent it to me)! 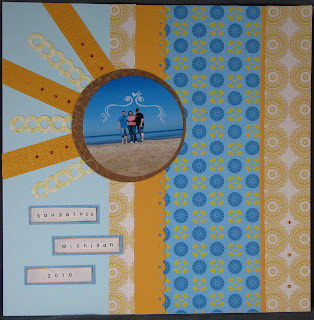 For Scrapfit, I actually sprayed a yellow mist on the Kraft cardstock, but you can't see it in the picture! I also got some scallops wet, stamped a little flourish on them, made them into the yellow flower you see and then misted it with the yellow shimmery mist, too! Well, I got out my needle and thread on this. My mother-in-law gave me the beautiful pearl beads! I don't know who the girls are--thought they were beautiful. They remind me of my mom when she was younger (at least from the pictures I've seen)! The gorgeous flower is Prima. Paper and ribbon are from Cosmo Cricket! I was pretty happy with this! I distressed the edges with Antique Linen Distress Ink. I did the tag for Sketches4All/you! If you like it, please consider leaving a comment! I "live" for comments. Well, maybe not "live," but I sure enjoy getting them! Here is a layout I did for Stacy HW's challenge on Sketches 4 All! If you are looking for a great challenge, click on the link and check out the site! The cute tree is Practicing Creativity Designs! This is for Frosted Design's Celebrate Life Challenge. 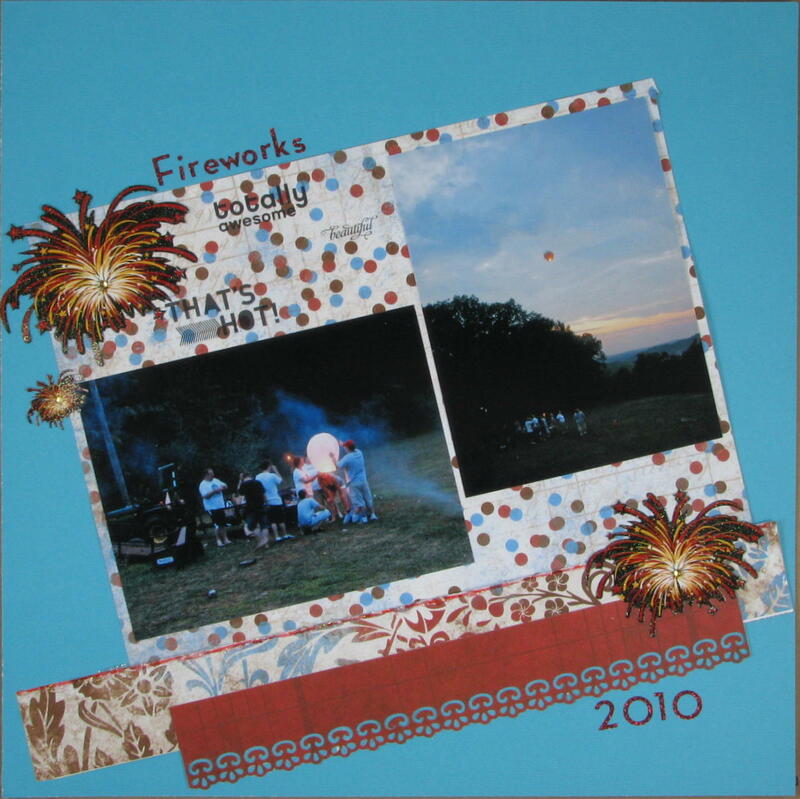 I made it from a sketch byKim Sparks that she posted on the Practical Scrapper's one year anniversary crop. 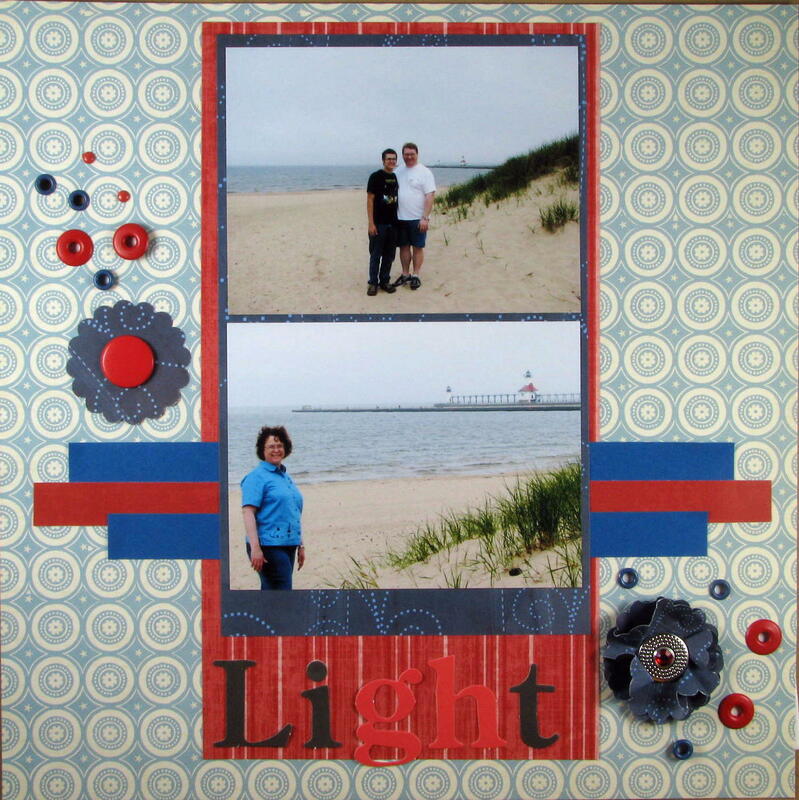 I used some of the goodies that I got from ArtfulDelight! I WISH YOU COULD SEE THIS IN PERSON! 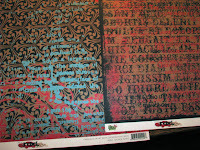 IT'S SO MUCH PRETTIER-THE TEXTURE OF THE PAPERS ARE AMAZING! Plus the jewels and the glitter on the circle/sun rays make it pretty cute! I created this for Sketchy Thursday's challenge. 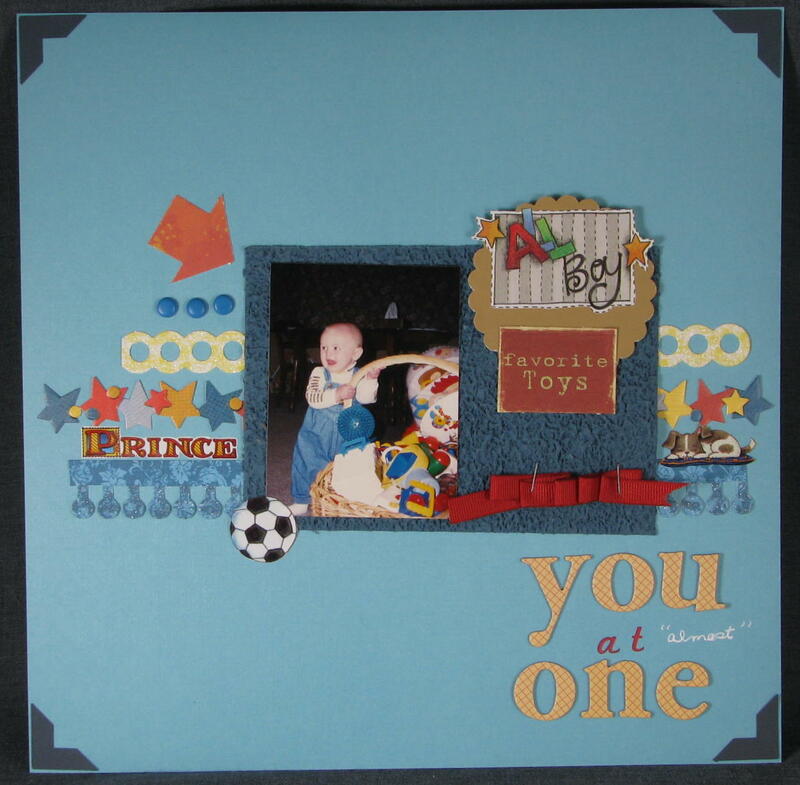 I used Core-dinations, GCD Studios and Lily Bee Design from a Scrapbooking from the Inside Out kit I won earlier called Courage; American Crafts, CTMH rub-on; letters from KaiserCraft; Fiskars threading water border punch; jewels from TPC Studio. for EtsyInspired and Practical Scrappers. I created this using Sketches in Thyme challenge 9. I flipped the sketch and only used one photo! I entered it at Practical Scrappers anniversary celebration and will also enter it Week 2- What Shape are you in Challenge???? 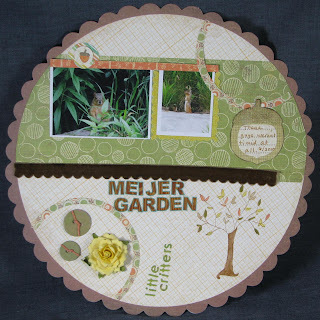 to use circles at the The Paper Trail(this challenge is just for fun! I don't even want to think about how many circles are on this page! From the holes in the border strip, to the dots on flower-shaped diecut, to the buttons, to the dots on the Jillibean journaling block there are quite a few! 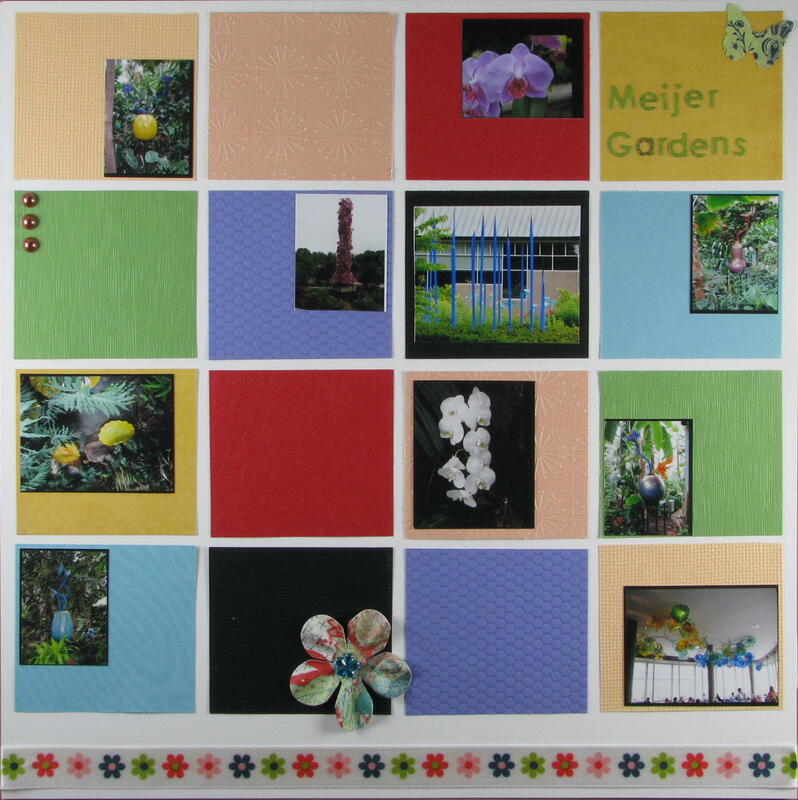 Grand Rapids -- Meijer Gardens --yes I took a lot of photos! I made this layout for a recent Sketchy Thursday's challenge! I made it really sparkle-y for Practical Scrappers! 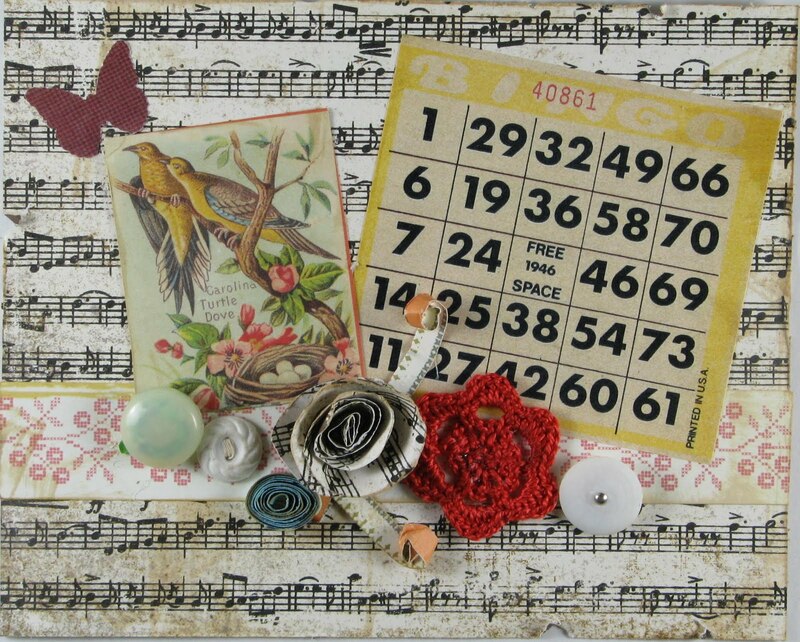 Letters are Prima; brads unknown; paper DCWV; journaling Making Memories; strips are from stash; I added a TPC Studio rub-on bird and 3 of their jewels to the journaling card. Here is a layout I created from a sketch by Erin at Practical Scrappers for the (paper) Trail Makers Challenge blog! I mainly used Pebbles! I've got all of the requirements! I thought my card turned out pretty well for someone who isn't that good at vintage! I used my new I-Rock on this layout! It takes a little getting used to, but it's quite fun! I'm sure I will be using it more in the future! I created this for the color challenge on Design Dollies! I'm also entering it at Sketches 4 All! 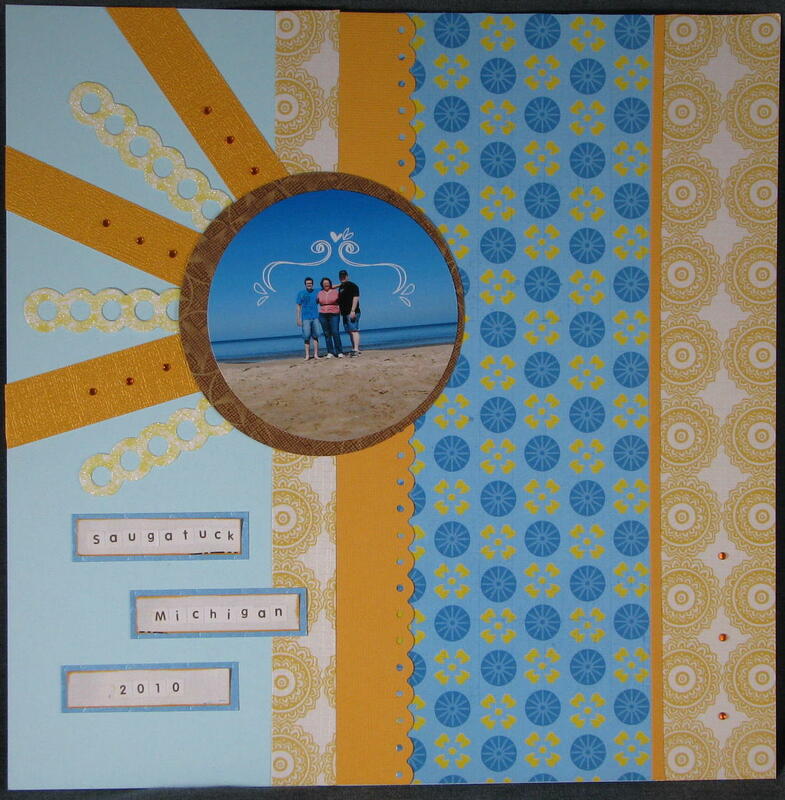 I did this layout with several challenges in mind (a lot for me, but I have seen crafters who enter 16 challenges at once which seems amazing to me). 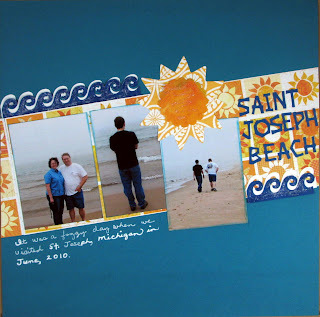 The first is a new challenge site to me: Artistic Inspirational Challenge Blog. I just happened to have the perfect photo and paper for this challenge. 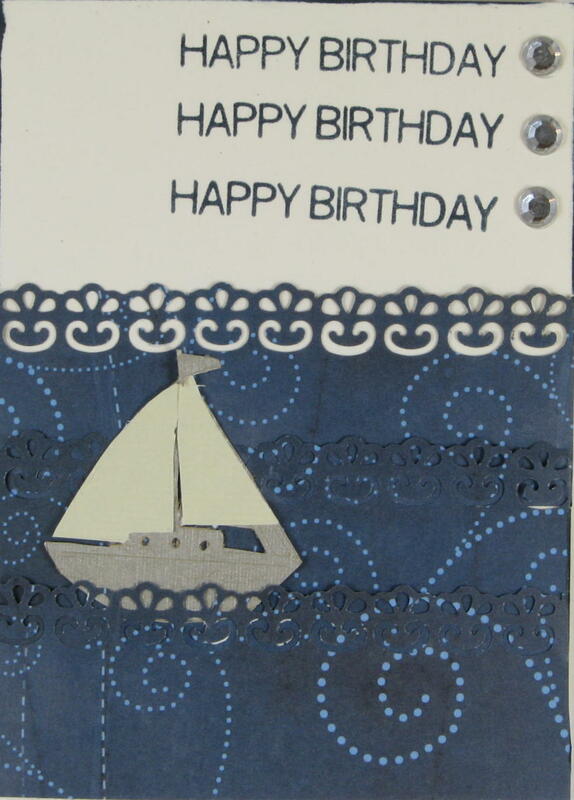 The green Glitz Designs background has blue writing (faint). The strips and inside of the sun were from a piece of paper I've had "forever" so I don't even remember the manufacturer, but it couldn't have been more perfect. I met all of the bonus requirements on this layout: 1. Sun or sunset = 1pt 2. Shades of blue and green on your layout = 2pts 3. A cut out black silhouette image =3pts. If you love art and are interested in incorporating ideas from paintings into your layout, I suggest you check out this cool blog challenge site!! The second challenge was Practical Scrappers challenge to use one photo! 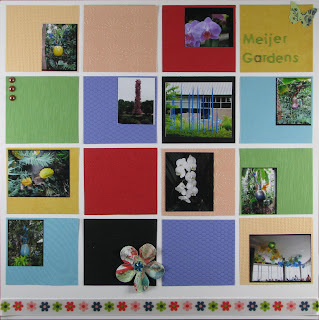 The third is for August Flower Challenge at Scrap Our Stash to make a flower. Mine is a simple spiral flower. You basically take a circle, cut it into a spiral and then roll it up and glue to hold the flower shape. 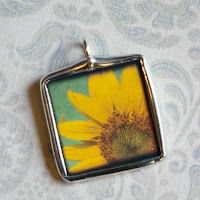 It is one of my favorite flowers to make as it is so easy to do, and it looks cute! You can roll it as tightly as you want and make the circle as large as you want!!! Easy peasy! Finally, Sketches 4 All! 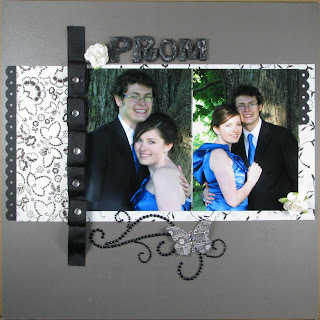 I made this by scraplifting a layout by StacyRodriguez over at Sketches for All. I'm entering it in Practical Scrappers challenge to use the word "one" in your layout and in Frosted Designs challenge to use an arrow! 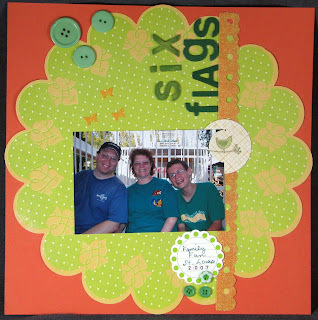 I used up some old supplies and some new borders from GCD! Everything is more straight in real life! I made this for a challenge over at Sketches For All. 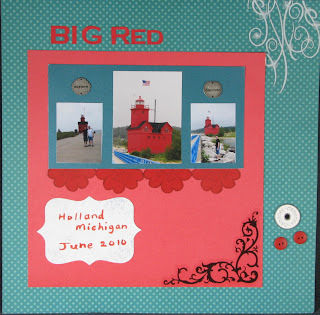 I used Brenda's sketch and Christy's colors: turquoise and red. I made this layout for the American Crafts Button challenge this week! 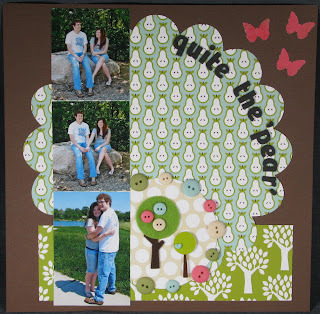 I thought the pear and tree papers were so adorable. I just had to use them as soon as I got them! I made it using Sketches in Thyme Challenge 8 sketch! It also fits Christy's challenge over at Sketches For All. I did this for several challenges at Sketches For All. Go over there for all of the fun challenges! There are usually prizes, but the challenges are just fun anyway!! :-) I added this to The Studio Challenge to use something as a mask--I have a heart just above the Hambly that I found in just lying around in my craft room and used it as a mask for my black home-made shimmery mist! Everything is Basic Grey with the exception of the flowers (Bazzill) and the ink which is Ranger Distress Ink in Aged Mahogany and my own shimmery mist which has alcohol inks mixed with CTMH re-inker (I've forgotten the exact colors now), alcohol, pearl-ex and water. Even though this isn't a great picture of us, I still love it because it is the only one of us together during our 10-year anniversary trip to San Francisco! We were standing on the grounds of Coit Tower. In the background, you can see the Ferry Building and the Oakland Bay Bridge. I made this layout based on Sketchy Thursday's 7-29-2010 great sketch! It also fit's Denise's challenge over at Sketches For All to use ink 2 ways (inked the edges of the paper and misted using my own hand-made shimmery mist). It's funny, EBTKS has a button challenge this week, too. A note about the supplies! My new blog friend Stacy H-W sent me most of the supplies that I used on this in a totally surprise RAK just to help me get my MOJO back! That was so great!